How should we best describe you? I would describe myself as an adventurer but my love for relaxing at home with good company would say otherwise. When did you start your project and when do you expect to complete? I started my Honours project in February 2017 and expect to finish at the end of the year. What biological process/ disease/ etc are you trying to understand in your research? My project revolves around looking at the immunity induced by administering a TLR agonist via different routes of vaccination. Considering that they're the sites of the body and the procedure in which a vaccine is delivered can highly influence its protective outcome, my project will hopefully guide vaccine delivery to maximise immunity towards targeted pathogens. I did a Bachelor of Science majoring in Microbiology and Immunology at the University of Melbourne. How did you hear about the Doherty Institute? As I majored in Microbiology and Immunology during my undergraduate studies, my coursework, the coordinators, and everyone involved is from within the Doherty Institute. What made you decide to study here? I had a lot of fun in my undergraduate degree because it gave me a chance to meet people who share my interests and gave me the opportunity to take control of my own learning; I therefore wanted to continue doing something that made me feel equally as happy and accomplished. What does a typical day look like for you at the Doherty Institute? A normal day would include being in the lab either planning and conducting experiments or doing chores in the lab to keep it clean and well maintained. In between that and taking multiple coffee breaks I would always try to read and write to make progress on my thesis. What gets you excited about coming here every day? I always enjoy the fact that there’s always something to do. However, the best moments of my time in the Doherty is when I have finished big experiments and they produce good results. Can you describe a pivotal or rewarding moment during your time here? Talking to my supervisors about the hard work and sacrifices it took them to get to the positions that they are in always motivate me to work as hard as them. It also shifted my perspective on academics, knowing that even in a field full of intellectually stimulating people, they were all hard workers. 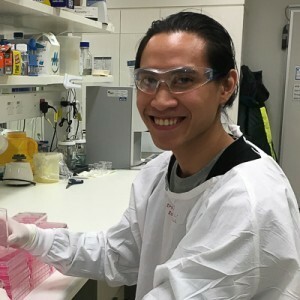 Identifying as someone who is always committed to working hard, this really encouraged me to strive to make a living in science knowing that with hard work one day I can call those who I look up to the most as my peers. Who is your supervisor and can you say anything about them that inspires you? Both Brendon and David are very inspirational people. What I admire most about them is their wealth of experience that they have and knowledge which extends far beyond microbiology and immunology. Did you expect to be working in this area of research? Has your career/ education path been what you expected at the outset? I never expected to work in any area of research given how intelligent researchers are. I always knew that pursuing this path would be challenging, however in experiencing it myself, I know now that the work requires an extreme amount of motivation and perseverance to keep on working towards a goal while facing a rollercoaster of emotion. Being an Honours student, I feel like the most challenging part of this position is to learn and retain a vast amount of information in such a short period of time. The most rewarding part of my role is the satisfaction you get when my supervisors are happy with my results and my progress. Who outside your immediate area are you networking with? Are you getting acquainted with other areas of research? Has this sparked any new leads, collaborations, directions in your research, etc? I haven’t had much exposure to any other fields outside my area mostly because there is still a lot in my field that is unknown to me. However, the various seminars the Doherty holds addressing political, social, and economical implications of the research conducted always encourages me to look at my research from different perspectives to get a more holistic view. What do you do when you aren’t researching/studying/writing up your research? In between studying and working I enjoy cycling and feeding my spending addiction with more cycling accessories.